Share the post "Listen To MASTODON’s Cover Of LED ZEPPELIN’s ‘Stairway To Heaven’"
For this year’s Record Store Day, Atlanta progressive metallers MASTODON released a cover of LED ZEPPELIN‘s “Stairway To Heaven” in honor of their late manager, Nick John. John, who also managed GOJIRA, passed away last September from pancreatic cancer. All proceeds from the single will be donated to pancreatic cancer research. You can now listen to MASTODON‘s version of “Stairway To Heaven” below. MASTODON said in a Facebook post: “In early September 2018, we lost one of our closest friends and our biggest fan, our manager Nick John. He was essentially the band’s Dad. From our highest highs to our lowest lows, he was always there. Every single move we made went through him first as our trust in him was marrow deep. His favorite band besides us and GOJIRA, was LED ZEPPELIN. We were asked to perform ‘Stairway To Heaven’ at his funeral. Afterward, finding out that someone had recorded it, we figured we should record a studio version and release it on Record Store Day as a tribute to Nick with all the proceeds to be donated to pancreatic cancer research. The limited-edition 10-inch vinyl features the Studio Version on Side A and a Live Version on Side B. It was made available in participating independent retailers on Saturday, April 13. 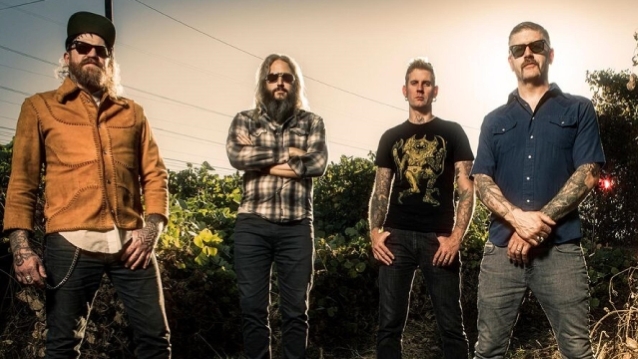 MASTODON and COHEED AND CAMBRIA will team up for a major U.S. tour this spring/summer. The 26-city “The Unheavenly Skye Tour” will see the bands performing across a range of venues from large theaters to outdoor amphitheaters this summer. MASTODON will perform its renowned “Crack The Skye” album in its entirety. Produced by Live Nation, the rock outing will kick off May 28 in Louisville, Kentucky at the Iroquois Amphitheater and will make stops in Boston, Chicago, Denver, Los Angeles, and more before wrapping July 3 in Irving, Texas at The Pavilion at Toyota Music Factory.